Things have change a bit since I recently read that the kind of giveaways we had each week over our Facebook page, were against Facebook’s promotions guidelines. But, since we won’t stop with the contests, we are finding out different ways to have them without breaking the rules! For this giveaway, you’ll need to read carefully & surf around our blog to find the answers to the following questions. Also remember you must LIKE (& TWEET if you have an account) each post! TIP: Read all the questions first, may be easier for you! 2) Click on the “Follow us on Twitter” button in the right side of the blog & look for our latest tweets (not necessarily the last one), you’ll find the second question there & where to find the answer. If you answered the 2 questions correctly, Liked the posts and shared on our wall the legend mentioned above, you’ll be entering to the sweepstakes! The contest will be open through Monday , March 14th at 12 pm (CST) so tell your friends to join too! 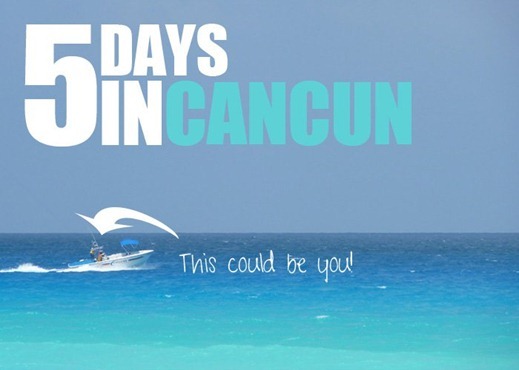 We have 3 Cancun vacation prizes (5 days of hotel accommodations for 2 adults & 2 kids!) & the winners will be picked randomly and announced on our wall! 2. ¿Puede tomarme una foto? Me puede tomar una foto? The Mexican Wine Festival sponsored by Xcaret and “Puede tomarme una foto?” are ending today. ¿Puede tomarme una foto, por favor? 1. The 1st Mexican Wine Festival ends today in Playa del Carmen. It was sponsored by the eco-park Xcaret. 1.The first Mexican wine festival,sponsored by the eco-park Xcaret ending Mar 12 in Playa del Carmen. 2. ¿Puede tomarme unable foto? The First Annual Mexican Wine Festival sponsered by eco park Xcaret…(Can you take my picture-Puedo tomarme una foto?? 1. The 1st Mexican Wine Festival ends today in Playa del Carmen. It was sponsored by the eco-park Xcaret. The 1st Mexican Wine Festival ends on Saturday, March 12th. The 1st Mexican Wine Festival sponsored by Xcaret. Sorry, I put my name there too just in case.